It's a Trimma tevegae goby. 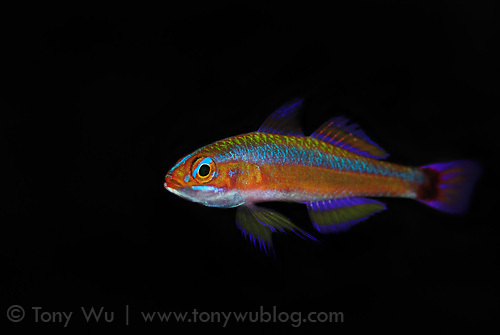 These fish are relatively common, but they don't actually look like much unless you shine light on them. Photographing one is a challenge (read: major pain in the rear), because (a) they're tiny; (b) they usually hang out under dark ledges where there's little to no light; and (c) they have a tendency to swim upside down in mid-water, just to make focusing and framing that much more aggravating. But wow...they are truly beautiful.